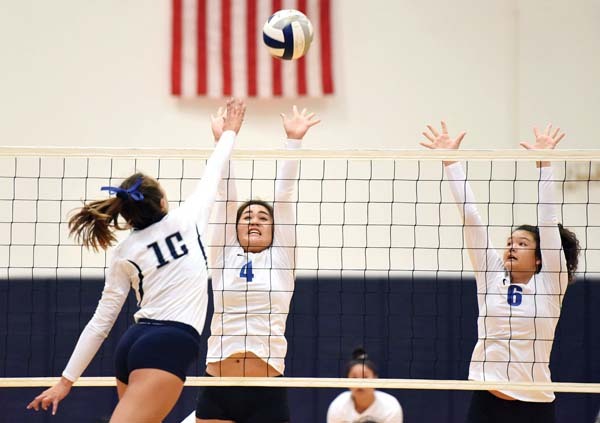 PUKALANI — The Maui Interscholastic League race in Division I girls volleyball appears to be wide open, and Kamehameha Schools Maui knows it. The Warriors began down a potentially tough road Thursday with a 25-17, 25-16, 25-22 victory over Maui High at Kaulaheanuio­kamo­ku Gym. 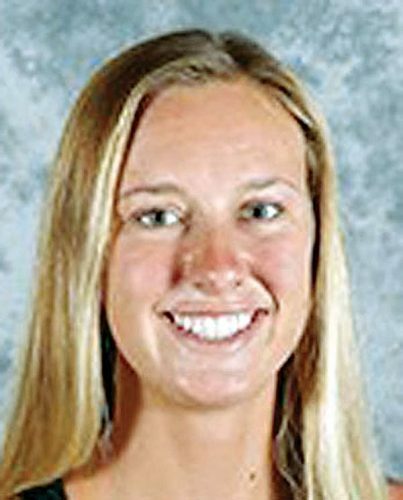 One indication that each match could be demanding came in the third set, during which the Sabers (0-2) rallied from as many as six points down and led 22-21. Kamehameha coach Alex Akaka called a timeout at that point, and Leauanae then tied the score on a dink. A block by Tatiana Martinez gave the lead back to the Warriors, and back-to-back kills by Alea Cervantes ended the match. Cervantes led the Warriors with 12 kills, Kimani Fernandez-Roy added 11, Logan Spencer finished with five and middle blocker Martinez added four kills and three aces. Next up for Kamehameha is three-time defending league champion King Kekaulike on Tuesday. Na Alii are without Kalena Vaivai, a first-team MIL All-Star last season who suffered a broken foot in a preseason tournament. 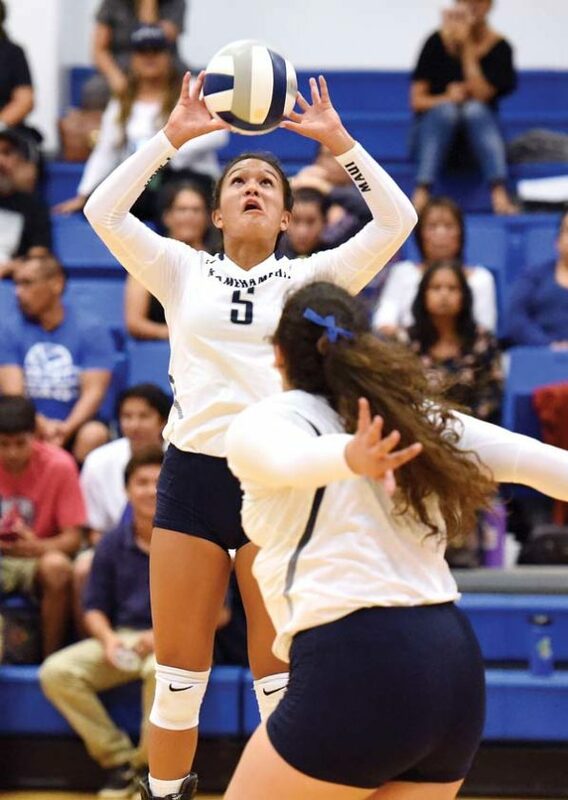 Baldwin took King Kekau­like to five sets earlier this week, and the Sabers, who have been limited to just eight practices because of renovations to their gym floor, opened their season with a five-set loss to Lahainaluna. After a kill by Javan Fernandez brought the Sabers within 18-17 in the first set, the Warriors went on a 7-0 run behind three kills by Fernandez-Roy. The Warriors scored 13 of the first 16 points of the second set. 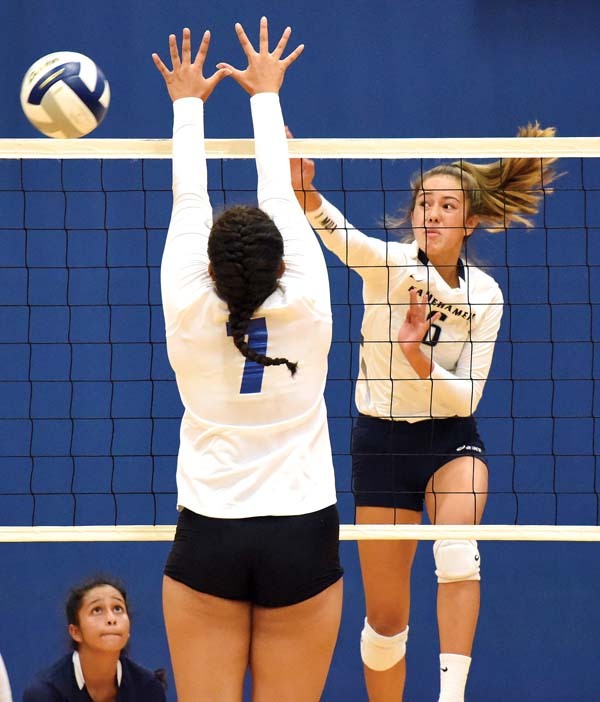 Maui High would draw within two, but Kamehameha then closed the set with an 11-4 run capped by a dink shot by Fernandez-Roy just over the Maui High block. Hana at Seabury Hall, 5 p.m.
Haleakala Waldorf at Molokai, 7 p.m.
Haleakala Waldorf at Molokai, 10 a.m.
St. Anthony vs. Maui Prep at Lahainaluna, 10 a.m.
Kamehameha Maui at King Kekaulike, 6 p.m.
St. Anthony vs. Seabury Hall at War Memorial Gym, 6 p.m.